From the All Extensions page, click on the fax extension link (usually extension “99”). Select the Fax Settings tab on the left to set up the fax extension. Click on the Users tab under Fax Settings in order to assign viewing privileges to the Users in your Halloo system for this fax extension. Note that if you have more than one fax extension on your system, you can assign unique viewing privileges for each extension by editing the Users subtab of each extension. Users who do not have fax viewing privileges for a given fax extension will not be able to click into the details for that extension. To automatically forward all new faxes to up to 3 email addresses, click the Forwarding subtab on the Fax Settings tab. Enter the appropriate email addresses in the “Forward faxes as email to:” fields. 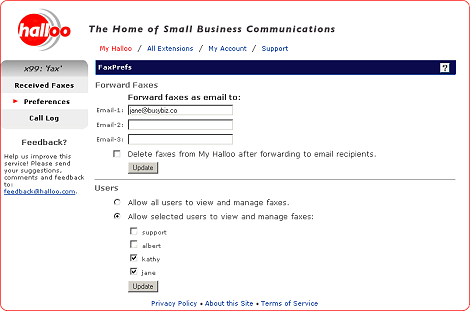 By leaving the faxes on My Halloo, you can view and manage your fax messages online just as you manage voicemail. Select the ‘Delete faxes...’ checkbox if you do not need to keep copies on the My Halloo system once they have been emailed. Be sure to click the [Save Changes] button to save your preferences.